Break out of your routine and try a restaurant that is new to you. There are more than 1,000 restaurants In Wichita to choose from, and a growing fleet of food trucks, too. Did you know that Livability.com ranked Wichita as a "Top 10 Surprising Foodie City"? And anytime there is a ranking or list of top restaurants in Kansas, Wichita eateries are sure to be on the list. Just recently, steak at Scotch & Sirloin, a BLT sandwich at The Anchor and chicken fried steak at Jimmie’s Diner made Food Network’s list of the places to eat Kansas’ most iconic dishes. And don’t forget dessert! Housemade desserts can be found on many menus. In fact, a slice of cake at The Kitchen made the above mentioned Food Network list. Plus, Wichita has amazing dessert-only spots, including Milkfloat, whose Lucky Charms milkshake recently received some love in Cosmo magazine. Yes, Wichita is easy to get around by car, but park yours and hop on the Q-Line to get a new view of our city. The Q-Line is a free shuttle service with friendly, knowledgeable drivers operating year-round. Earlier this year, it expanded its routes to include Delano/Old Town, Government Center, Douglas and Old Town. Ride the whole distance to check out the scenery, then decide where you want to stop. Once on board, you can stop the Q-Line at any time by pulling the cord located near the windows on both sides of the trolley. There are plenty of restaurants, bars, museums, entertainment venues and shopping along the routes. The four routes run at various times and days and include a lunch route during the week and evening and late night routs during the week and on weekends. To see the full list of routes and times, check out the Q-Line site by clicking here. Mosley Street Melodrama, Prairie Rose Chuckwagon Supper and a variety of performances booked at Roxy&apos;s Downtown and Orpheum Theatre and other venues throughout Wichita. Northeast Wichita, northwest Wichita, Riverside, College Hill, Historic Delano District, Old Town District, Douglas Design District … Wichita is a city of neighborhoods and districts. Explore an area you’re not familiar with or haven’t been to in awhile, and you’re sure to discover new parks, shops and restaurants. Sometimes it takes out-of-towners to clue us in to new developments in our own town. Delano was named most hipster neighborhood in Kansas by BuzzFeed in 2016, and blogger Erika Reals let her readers know about a Wichita spot she fell in love with while the Kansan-turned-New Yorker was back home visiting in 2016. 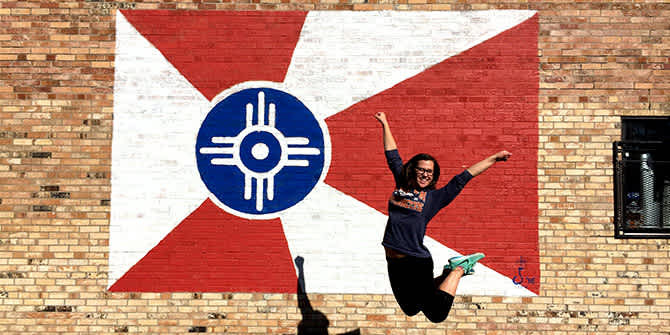 On her blog, The Everyday Vacationist, she boasted that she’d found “the coolest corner in Wichita” when she visited a cluster of shops in Riverside that include Songbird Juice Co., R Coffee House and Chiquita&apos;s Corner, a tiny restaurant serving Mexican, barbecue, egg rolls, bottles of Coke and ice cream. File Memories Park in the “I didn’t know we had that in Wichita” category. Many people haven’t been out to see the nearly 9-foot tall Adirondack chair at Memories Park, which opened in December 2014 on the west side of Sedgwick County Park. In addition to the chair, there are other fun props designed to serve as backdrops for photos, a place for friends and family to make and capture memories. There’s also a tandem bicycle, a hay wagon and a vintage Chevy truck. Another popular backdrop for photos are the growing number of murals in downtown Wichita and throughout the Douglas Design District. Many are Wichita-centric, highlighting the flag, Keeper of the Plains or other city icons, while other murals are simply beautiful art. Read our murals blog post to see more about our urban art.